Buffing and polishing metals, stone, glass and wood is easily done with the aid of a rotary tool and various buffs, wheels, mops, bobs, pastes and compounds. However, sometimes you need some control over the material you are polishing and you may need to be careful where the polisher or abrasive is applied to prevent further scratching, marking or polishing. It may be that you want a desired finish on one section of the work and not another, or perhaps the piece you are polishing requires some specific shaped polishing tool and therefore you need to cut and make your own tools. 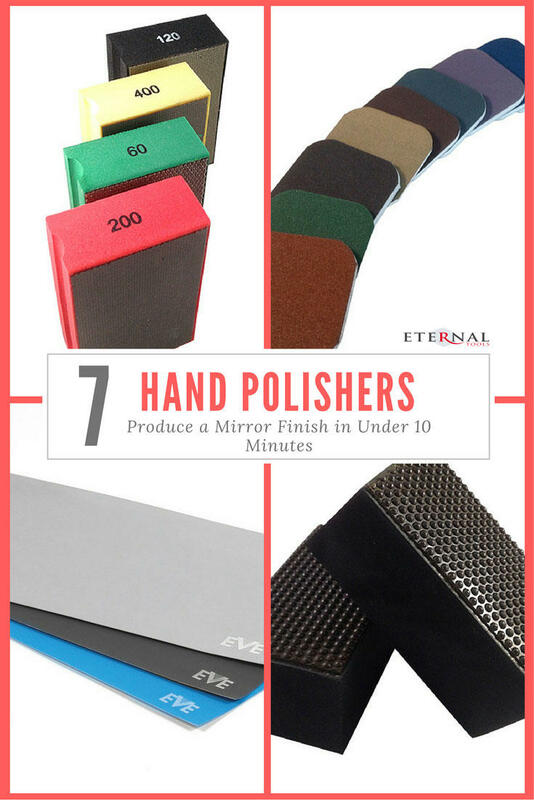 The following polishers are to be used on metals, glass, stone, ceramics, hard woods, enamels and plastics to achieve a mirror finish shine in under 10 minutes. Each hand polisher as the name suggests can be used by hand without the need for a machine or rotary tool, and each one can be cut, flexed and manipulated to be applied to your work whatever the size or shape. Diamond grit has been used as an abrasive for a long time for polishing hard materials but usually the diamond abrasive is attached to a fixed object such as a diamond burr or a diamond file. This isn't always convenient when you want to be able to polish in awkward areas or make your own diamond tools with a much finer diamond grit. With these cloths you get the cutting power of a diamond but on tough and flexible fabric cloth. Each cloth is impregnated with very fine diamond abrasive and they are wonderfully adaptable and easy to use. Diamond is the hardest natural material so these cloths are much tougher and longer lasting than aluminium oxide paper, sanding paper or emery paper. This also means you can use them on just about any other hard material. You can use the cloths as they are or cut them to any shape you like and stick them to mounts, mandrels, sticks and objects to make your own tools. Use them as you would sandpaper or any other abrasive. Why not try making some home made buff or emery sticks? Cut or find some wood in the desired shape, wrap the diamond cloth around and secure with glue, tape or staples. These particular diamond polishing cloths are made by EVE, or Ernst Vetter, in Germany. Not so much a polisher, but more of a flexible grinding sheet with a sticky, adhesive backing. They are worth mentioning in this hand polishing article because if you like using the above diamond polishing cloths we spoke about, then these flexible sheets act as a great pre-polisher to the cloths. They are 600 grit (15 microns) which is still a fine grade of diamond grit, but coarser than the diamond polishing cloths. They are brilliant for removing any unwanted marks and snags on your work before moving on to using either the cloths, diamond polishing paste or other polisher. They measure 50mm x 100mm (2" x 4"), are 0.3mm thick and the sheet is bendy with a sticky back. Cut the sheet into your desired shape and size, peel off the paper backing and stick the abrasive to whatever you fancy to make your own grinding, shaping, deburring, polishing and sharpening tools. To try and explain how Micro Mesh differs over other abrasives lets use polishing metals as an example. If you are using an abrasive emery stick you quite often find you have to repeatedly buff backwards and forwards to try and achieve a smooth finish. With each stroke you can often create more marks and scratches instead of removing them because the backing to the abrasive is solid and unforgiving. With Micro Mesh pads the cushioned foam backing allows a little more give, and subtlety. You can produce a really nice satin finish faster and more evenly than with conventional papers, and without you having to continuously cover your tracks all the time by polishing over what you've already polished in order to try and remove scratches. Without wanting to get too technical, the abrasive crystals in these pads are larger than in conventional paper abrasives so they last longer and do not clog so easily. You will get better, and quicker results without so much elbow grease. A Luthier. Musical instrument makers. Can be used wet or dry but to preserve the life of the pad, use wet with little pressure and dry off thoroughly after use. This particular set contains a full range of nine different grades from coarse to medium to fine and ultra-fine so you can start on a piece and take it right through to a final finish. The pads are approximately two inches square and double-sided with rounded corners. "Pleased with the micro mesh pads, very practical, full range from coarse to very fine mesh. Haven't yet tried the pads on plastics, but I have heard from other users that these micro mesh pads are the solution to obtain a satisfactory gloss on those materials which are so difficult to polish. This may sound obvious, but these are called hand pads because they comfortably fit in your hand making them easy to hold and easy to work with. Because of their flexibility they work well on polishing curved edges or dome shapes. With a multitude of uses, these pads are great to have around in different grit sizes to fulfill all your jobs. 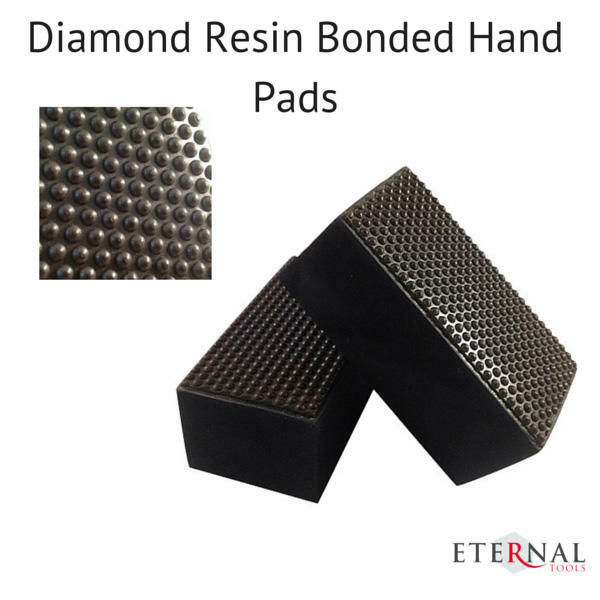 These pads are used in exactly the same way as the diamond hand pads mentioned above except they are specifically to be used on all types of stone. 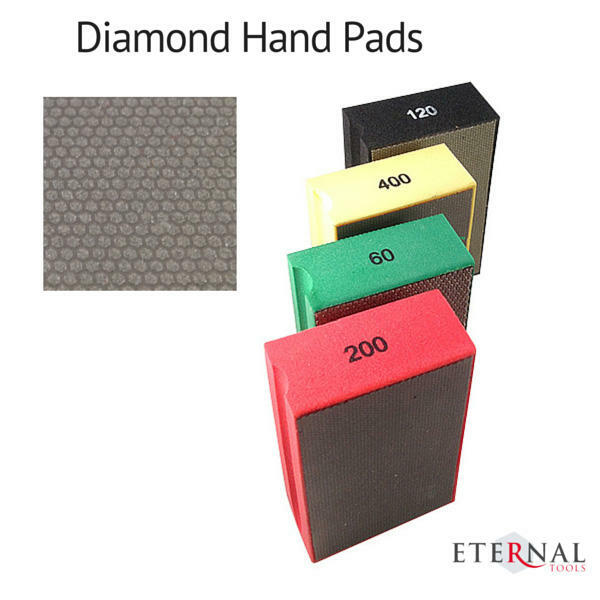 They are resin bonded so the surface feels rubbery in comparison to the standard diamond hand pads. 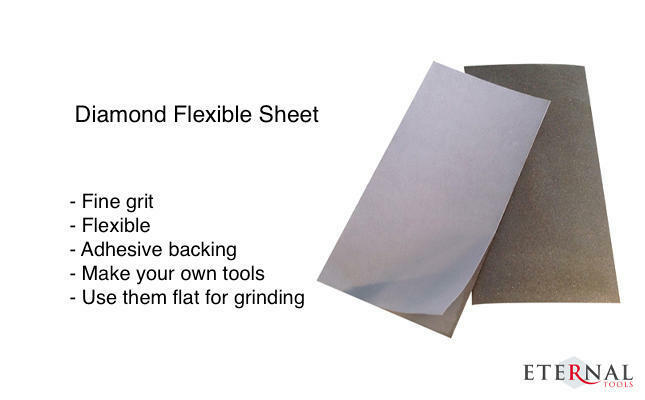 If you need finer grits and more flexible diamond sheets to custom make your own tools or for surface contour polishing, take a look at our Diamond Abrasive Polishing Cloths mentioned above. 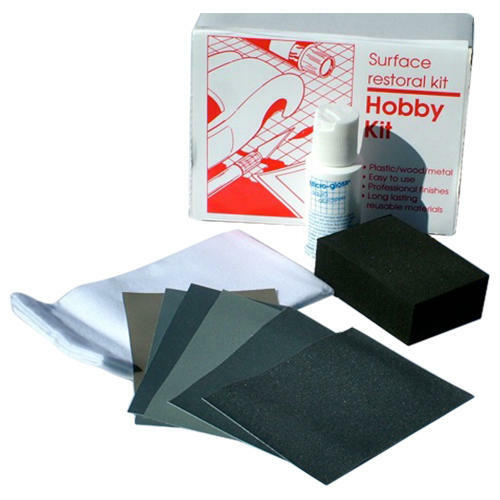 This is a handy surface restoration kit for plastic, wood, metal, painted surfaces and ceramics for removing defects and polishing to a high lustre. Used in jewellery making, model making, clock and watch making, ceramics and fine art. Not hand polishers as such, but diamond paste and Dialux Polishing compounds deserve to have a rightful place in this article because they can be applied to anything and used by hand to polish a whole myriad of materials. Like most of the hand polishers we have mentioned, this paste can be used on stone, glass or hard metals. Available in fine to coarse grades, you can take a relatively coarse and grained looking piece of metal, stone or glass work down to a superb mirror finish in no time. The diamond grinding paste is mixed with a water soluble oil and comes in an easy to apply 5g syringe, so the paste is ready to use and is easy to apply. They are graded in microns rather than diamond grit and can be bought in the following micron sizes. Also shown is a rough conversion chart from micron to grit. HELPFUL TIP: Apply with a piece of wood such as a peg or tooth pick (for very detailed work), a piece of leather or flexible plastic or one of our felt polishing bobs. The finer grades of paste will absorb into wool, felt or material so be sure to apply these with wood, leather or plastic. Many scientists use the 0.25 micron to give a microscopic ultra smooth finish. Ideal for removing scratches on watch glass, glass or gemstones. Try starting with 6 micron (yellow), then 3 micron (green) and so on until the desired finish is achieved. On this note, if you have a plastic watch glass you will need to use Polywatch. Polywatch is a very light abrasive used for removing scratches from plastic watch glasses. It comes in a handy size tube and can be applied with a bit of cotton wool. To apply the paste you can either use a felt polishing bob on a rotary tool,a piece of leather or wood or if polishing a pivot then apply the paste directly and then use a wooden peg to grind with. Alternatively apply to a soft wheel using a canvas belt, one belt for each grade. There are so many ways to apply the paste it seems that everyone has their own method, I have even heard of one horologist using some old camera film! "Great, grinding paste, removes fine scratches from crystal glass with a little bit of elbow grease or a Dremel. 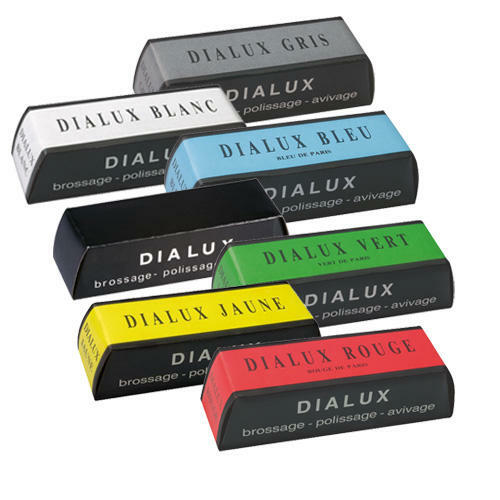 Have also removed scratches from sunglasses, worked really well""For a wee scratch on a hard stone, this paste did an excellent job; not too pricey either"
The Dialux range of polishing compounds (sometimes referred to as Rouge and Tripoli) really is the Rolls Royce of compounds for polishing metals. The compound is uniformly blended with abrasive grit so only a small amount needs to be applied to a felt bob or wheel with minimum clean up required. 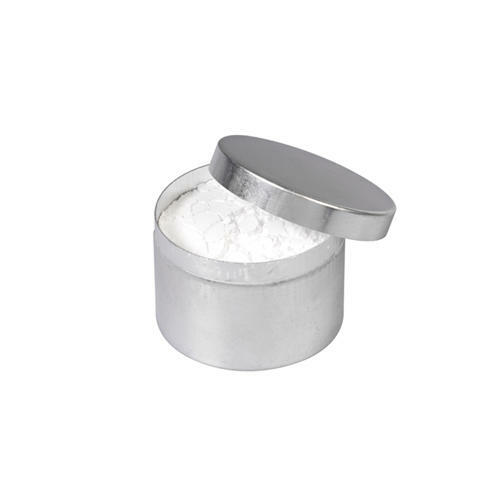 Diamantine is a very fine powder used primarily by watchmakers to produce a mirror finish, scratch free on hardened steel pivots and jewels. You mix the powder with a tiny bit of oil to form a thick putty-like paste. For further help on using Diamantine have a read of the late George Daniels book 'Watchmaking'.